A Pre-tensioner can be used when installing longer runs of cable. It allows you to tension the cable through the last intermediate post, making it easy to connect to the last (end) post. When renting installation tools, Pre-tensioners must be requested. NOTE: Pre-tensioner locking grippers are used with the pre-tensioner. 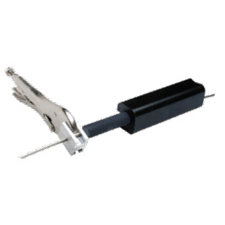 Each cable diameter requires individual grippers which must be ordered separately.